Sometime in the last week, not one but two of these billboards appeared in the front yards of blocks of units on a street in Ashfield. 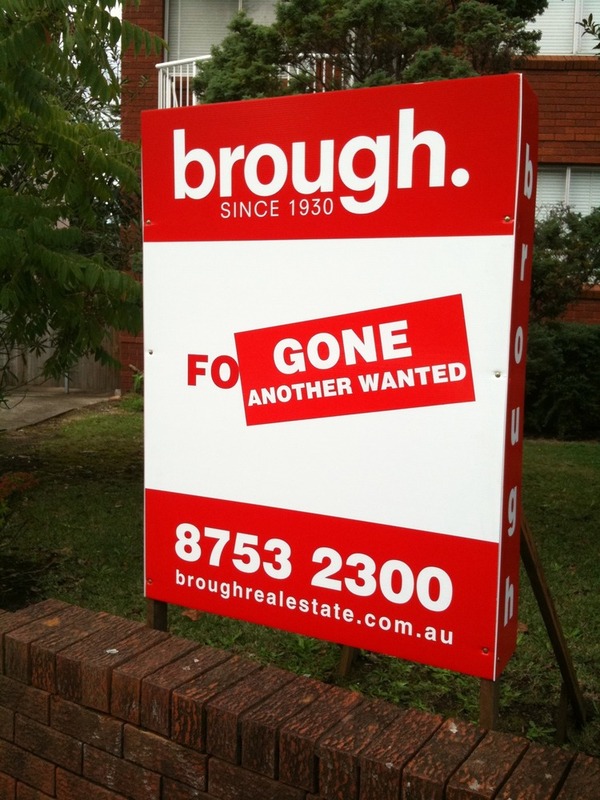 Surprisingly spartan on details, the board implies that the wizards at Brough Real Estate have made two sets of sellers, buyers and a themselves very happy, an increasingly difficult task in the current climate. Less believable is the fact these properties are directly opposite each other. Clearly this is a ruse. With a reported 350,000 properties on the market across the country, the question becomes, who is the audience for this call to action? This entry was posted in Economy and tagged bubble on April 17, 2011 by Dave Cheney. To steal a quote from Liaquat Ahamed’s Lords of Finance the best days of Australian housing bubble may be behind it. As an amateur economist and armchair property speculator I wanted to share my views on this subject. During the 60s and 70s Ashfield, the formerly Polish, now Chinese migrant, inner west suburb of Sydney succumbed to vast swathes of development which saw the majority of Colonial and Fediterania bungalows replaced by two and three story apartment blocks. Due of their ubiquity and near identical layout, these properties provide an opportunity to study the effects of the Australian housing boom on a particular class of asset; the quintessential two bedroom flat. Skipping forward a few decades to October 2009, it was a heady time for the Sydney housing market, and it was no different for Vendors in Ashfield. Landlords were dumping unrenovated 2 bedroom units onto the private market for $400,000 a pop. Saturday mornings saw Agents, weighed down with keys, leading platoons of eager DINKYs from inspecting to inspection. Estate agents, banks and solicitors were doing a roaring trade on the back of the dying months of the final extension of the First Home Buyers grant. Those who waited for the governments handouts to cease in the hope that the market would cool were out of luck, twelve months later I watched a 2br flat sell at auction for over $520,000. However the present day in Ashfield reveals a different picture. The previous weekend I attended two auctions with similar outcomes. The first apartment, a ground floor flat sold for $370,000 to the first, and only bidder. The second, with rubberneckers spilling onto the stairs, was passed in at $451,000 after the vendor bid failed to push the lacklustre bidding above the reserve. Much has been written about the Australian housing bubble, and I believe the diagnosis to be accurate. Clearly my shoulder surfing a brace of sales does not represent a trend, and more data is needed before I can say the age of the half million dollar Ashfield flat is over. What is, however, less clear to me, is the prognosis for the price of 70 square meters of real estate in Ashfield. Will the reported 350,000 properties on the Australian market drive down prices, or will they be quietly be withdrawn to await more favourable conditions ? Does the US example of Federally insured non redress loans provide an accurate model for the future of the Australian property market, or should we look to Spain or Portugal for clues ? Which way will interest rates move in the next few quarters ? Would raising them cause a firesale of properties, or would homeowners instead retreat further from the retail market ? Would lowering them continue to support this over inflated market, driving prices higher and with it, increased wage claims ? This entry was posted in Economy and tagged bubble on April 13, 2011 by Dave Cheney.